IIMC Application Form 2019: Indian Institute of Mass Communication has released the Application Form for admission to PG Diploma Courses. The Institute has released the Application Form in an online mode on the official website. Candidates must fill the Application Form and submit it before the due date. The authorities have released the important dates for the admission procedure on the official website of the Institute. The submission of the Application Form is an important part of the admission procedure. The candidate who cannot submit the complete applications will not be able to appear for the entrance test or download the Admit card. The candidates must read the Information Brochure very carefully. The authorities have released the brochure with the Application Form. For more of the details of IIMC Application Form 2019 go through the article from below. New: Indian Institute of Mass Communication has released the Application Form for the admission to the PG Diploma courses. The last date for the submission of the form is 12th May 2019. 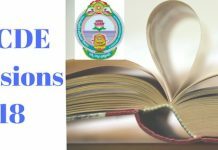 Fill IIMC Application Form 2019 here. Go through IIMC Information Brochure 2019. Indian Institute of Mass Communication has released the Application Form in an online mode and the offline mode. The candidates who are planning on appearing for the entrance test must keep themselves updated with the latest released updates related to the Admission procedure. The schedule mentions the important dates for the admission procedure. The candidate must keep visiting the website on a regular basis for the updates and events. Educational Qualification: The candidate must have a Bachelor’s degree in any discipline. Maximum Age: Candidates must have been born on or after 1st August 1993 (1st August 1988 in case of SC/ST/PH and 1st August 1990 in case of OBC). Nationality: The candidate must be an Indian national. The institute has released the application Form in an online mode and the offline mode. The candidates must fill the Application Form to apply for the admission to the Diploma course. It is important that the candidates go through the procedure of filling up the Application Form and submit the Application before the due date. The aspirant can gather the Application Form from the website and must keep the last date of submission in mind. It is important for the aspirant that they go through the eligibility criteria in detail before proceeding to fill up the Application Form. The candidate must go through the eligibility criteria in detail from the Information Brochure. The candidates also must go through the Information Brochure to get an idea of how to fill up the Application Form so to avoid any form of error while providing details. The details which have to be provided in the Application Form will be the Personal Details, Academic Details, Contact Information and uploading the photograph and the signature as per the specifications provided in the Information Brochure. The applicant must provide the correct and valid details in the Application Form. The authorities will cross check the details at the time of the final admission. In case the details provided are invalid or incorrect, the candidature will be liable for the cancellation. The final submission of the Application Form will only be after the payment of the Application fee, the amount of which will be provided in the Information Brochure. The authorities must submit the online Applications in an online mode. The candidate must send the complete offline Application along with DD to the Institute’s address. Step 1 Filling up the Application Form: The candidate must fill up the Application Form by providing the basic details such as the Personal Information, Academic details, Contact Information. Candidates will be able to access the Application Form from the official website of the Institute. The details provided must be valid and correct in this section of the Application form. The candidate will have to upload the photograph and signature as per the specifications. The details provided in the form must be valid and correct. Step 2 Payment of the Application Fee: After providing all the details in the Application Form, the next step will of the payment of the Application Fee, the amount of which will be provided in the Information Brochure which will be released along with the Application Form. Step 3 Submission of IIMC Application Form: After the successful payment of the Application Form, the candidate will receive a confirmation mail after the payment has been done and the Application has been submitted. The candidates must get the print out of the Confirmation Page after receiving the mail for the future references. The confirmation page will be asked at the time of the admission. Find the details of submitting the Application Form if applying through an Offline mode. Candidates will have to provide with all the details and the submission of the form will have to be through the post. The payment has to be done through the Demand Draft. Find the steps of filling the Application Form offline from the points below. The application form can be obtained from the office of the Institute on payment of Rs. 1200/- for general category and Rs. 1100/- for SC/ST/OBC/PH category through a demand draft only, drawn on any scheduled bank payable to Registrar IIMC at New Delhi, from IIMC New Delhi or IIMC Dhenkanal (Odisha). It can also be received by post for which you shall have to make a request by post along with an enclosed DD as above and self-addressed Envelope with a stamp of Rs. 70/-. You can also download the application form from official website of IIMC and take a printout and fill it and post it along with a DD. The availability of the Application Form of IIMC will be in an online as well as the offline mode. The candidates can submit the Application as per their preference. The procedure and the payment of the online Application will be entirely in an online mode. The payment of the offline Application will be through Demand Draft. The forms have to be sent to at the allotted centre of the Institute. The details provided in the Application form must be valid and correct. Any form of invalid or wrong information will lead to the cancellation of the candidature. The candidate must fill the Application Form with the utmost care. The IIMC Application Form is submitted after the successful payment of the Application Fee. The Applications will not be accepted otherwise. Next articleAFMC MBBS Counseling 2019- Check Dates, Counseling Round details etc. WB ANM/GNM Nursing Application Form 2019 – To be released soon, Check Dates, Application Process, etc.